Without a dominant racer and a slew of injuries to top riders throughout the season the U.S. men’s elite field has been tough to predict, week to week. Coming into cyclocross nationals, picking the favorites was no easy task, but started to fall into place after last weekend’s NBX C1 race. A consistently strong Kerry Werner, a progressively stronger Curtis White and a resurgent Stephen Hyde seemed to be the front runners to take the title. And now we know the answer. Yes, Hecht will be racing the elites. With a recent sweep of Resolution Cup, a win at the Silver Goose, a big win at Kings Cross, it’s clear that this decision puts Hecht smack in the middle of the favorites conversation. And that’s not to say he’d be a shoe in to win the U23 race. That field is stacked. But jumping to the open race will certainly add more spark to an already exciting field. CXHAIRS: Really stoked that you’ve made this decision. It’s going to make the race that much more exciting. What is the thinking behind racing elites instead of U23s? Both are strong fields so it’s not like one race is going to be easier than the other. HECHT: I had been talking with my director on Alpha Bicycle Co./Groove Subaru, Adam Rachubinski, since the beginning of the year about this possibility. Initially I had my heart set on getting that U23 title because of my race last year in Reno. As the season progressed, I started gaining some momentum and getting results in some of the major UCI races. After winning the C1 in Cincinnati, I gained the confidence that I had the honest chance of winning at races around this caliber. Sure, I am not going to win all the time, but with some luck I could find myself at the leading end of our American elite races. On top of this, as I continue to grow, I want to give myself the best chances of being a successful professional cyclocross racer that I can. A good result in Elite nationals would be a great bullet point on my resumé. 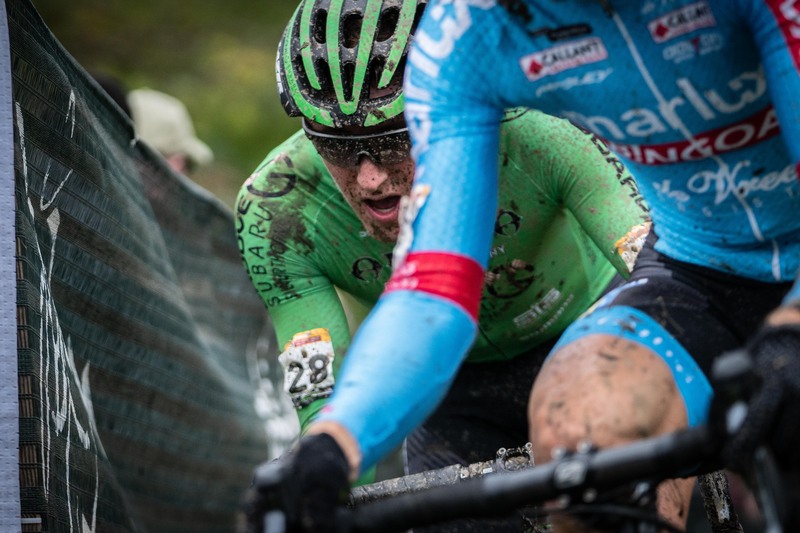 CXHAIRS: Are you just doing this so you don’t have to race those other fast U23s? HECHT: Haha yeah, the group of U23’s are very strong and the depth is incredible. CXHAIRS: You’ve already had success against all of the favorites in the men’s elite field. And this decision is definitely going to have those guys reassessing the threats to the title. Is that part of the challenge for you? Playing the spoiler? HECHT: This is a big part of it. Racing on the road with Aevolo for the past couple of years has given me the chance to compete as the underdog of the group. I have found I really enjoy being in this position. It gives me the chance to set my goals high and grow into a better rider. CXHAIRS: Second place finish to Hyde at Joe Creason Park last year in The Derby Cup followed up by a win in the U23 Pan Ams. There are some changes to the track this year including some sand, but it’s essentially the same as last year. Give me a quick breakdown of the track. What you like, what you think are the challenges. HECHT: The track definitely favors a rider who can ride with power for a more extended period of time. The course presents a lot of long climbs and tricky, sometimes slippery, descents. I think those power sections will help me out a bit. I find that I can draw from my road experience on these. I’m not sure what the sand will be like, but from what I hear of it, this obstacle will be a challenging one. CXHAIRS: Are you hoping for sloppy conditions? You had a great day at King’s Cross against the same field you’ll be racing at CXNats. HECHT: I definitely would like to see some wet conditions. Not only do I feel that I perform well in these conditions, but the mud and the ruts really bring the little kid in me out and I have a blast riding in these condition. CXHAIRS: Fourth at nationals in January in the U23 field. You don’t feel like you have unfinished business there? HECHT: I definitely am bummed, but I still feel as though I can hold my head high after winning Pan-American Championships. While it’s not the same race, it holds a similar value. CXHAIRS: Does the decision to race elites this year have anything to do with your future racing plans? For instance, will you be cutting down on cx racing next year and concentrate more on road? HECHT: This decision doesn’t really change what my road season will look like next year. Of course, I will keep trying to grow and race at the next higher level on the road, but I would like to do the same on the cyclocross bike. So there you have it. Stay tuned to cxhairs.com for much more from this weekend’s Ruts n Guts and all next week at U.S. Cyclocross Nationals.